Sea? oor Mapping better accuracy and coverage than all previous altimeters,” said Sandwell. Global maps constructed using satellite-derived gravity data will never replace the ships. The resolution of this new method is limited by the ocean depth because the potential ? eld which gets smooth as you go from the bottom of the ocean to the surface. Whereas, the standard ship-based multi- beam echo-sounders resolves features on the sea? oor in high resolution about 100 meters across. The problem is in our lifetime we will probably never see the complete mapping of the sea? oor by ships. Which makes the satellite data vital to ? lling in the gaps. The main challenges scientists face in developing these gravity ? eld models is improving the resolution from the sat- ellite altimetry data. Sea surface topography is a noisy mea- surement as the waves roughen the ocean’s surface making the range measurement less precise. 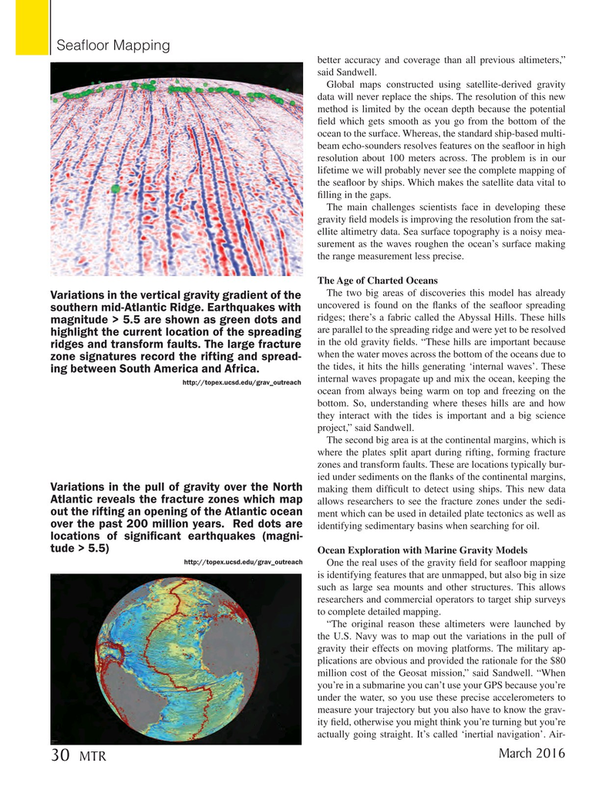 Variations in the vertical gravity gradient of the uncovered is found on the ? anks of the sea? oor spreading southern mid-Atlantic Ridge. Earthquakes with ridges; there’s a fabric called the Abyssal Hills. These hills magnitude > 5.5 are shown as green dots and are parallel to the spreading ridge and were yet to be resolved highlight the current location of the spreading in the old gravity ? elds. “These hills are important because ridges and transform faults. The large fracture when the water moves across the bottom of the oceans due to zone signatures record the rifting and spread- the tides, it hits the hills generating ‘internal waves’. These ing between South America and Africa. internal waves propagate up and mix the ocean, keeping the http://topex.ucsd.edu/grav_outreach ocean from always being warm on top and freezing on the bottom. So, understanding where theses hills are and how they interact with the tides is important and a big science project,” said Sandwell.